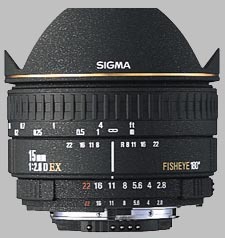 (From Sigma lens literature) This diagonal fisheye lens has an angle of view of 180 degrees in the diagonal direction as well as minimum shooting distance of 15cm (5.9 in.). The minimum shooting distance of this lens is only 15cm (5.9 in.) and it has maximum magnification of 1:3.8. The majority of Digital SLR cameras have a smaller image sensor size than 35mm film. Therefore, angle of view of 180 degrees cannot be obtained with most Digital SLR cameras. However, because it uses only the center part of the frame, peripheral distortion will be very low. This lens seems to do everything that it should. Most important it is sharp and shows only moderate flare even with the sun in the frame. Contrast is also good. I am using one on a Canon 5D, and have not had any problems with ghosting, so wouldn't trade up for the DG version.